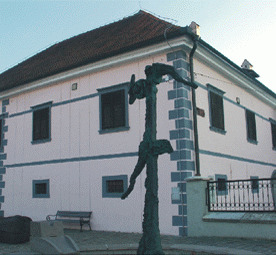 Since 1958, this ministerial house situated in the old town of Kostanjevica na Krki functions as dislocated unit of the Božidar Jakac Art Museum, Lamut’s Art Salon. The exhibition ground is named after the painter and printmaker Vladimir Lamut (1915 – 1962) whose many works are made in Kostanjevica na Krki. It is also a site of temporary exhibitions and cultural events.